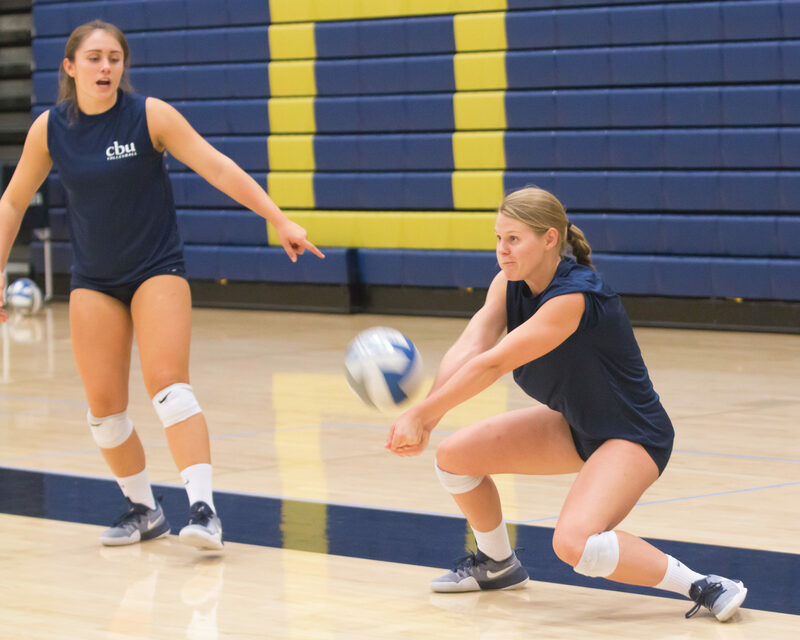 [Lauren Shelburne | Banner] Tori Ortman, senior kinesiology major and libero, focuses on her passes in practice. The team is off to a perfect start this season, earning the sweep at the Seaside Invitational at Point Loma Nazarene University. The team has been favored to win the PacWest conference this season. After a dominant season in 2015, the women’s volleyball team at California Baptist University is off to a perfect start, going 4-0 at the Seaside Invitational. The team, who is favored to win the PacWest Conference, returns three All-PacWest players, including Jenna Perry, senior liberal studies major and outside hitter, and Lauren Hackett, junior graphic design major and outside hitter. Perry, who was named the Seaside Invitational MVP, picked up the team’s first PacWest Player of the Week honor. Perry and the rest of the team fought to the finish of every game in the tournament, earning the sweep. Branden Higa, head coach of the team, said they improved more and more in each match. The newcomers and returners mixed well on the weekend. A standout was Sydney Kralj, junior marketing major and setter. Kralj, who had an impressive career at California State University, Los Angeles, led the team with 79 assists over the weekend. Perry logged a .522 hitting percentage with 27 kills. Hackett had 30 kills on a .375 percentage. As a whole, the team maintained a .358 attack percentage and keep their opponents at a low -.042 mark. On the defensive end, Kristin McCord, senior mathematics major and outside hitter, and Tori Ortman, senior kinesiology major and libero, were dominant on the court. The team will travel to Rohnert Park, California, to compete in the DII West Region Volleyball Showcase Sept. 8-10, where they will take on four challenging Division II opponents.